A well-styled mannequin catches your attention in a store window, and also stands out as stylish vertical storage for hats, scarves and jewelry. They are perfectly sized for a narrow nest. 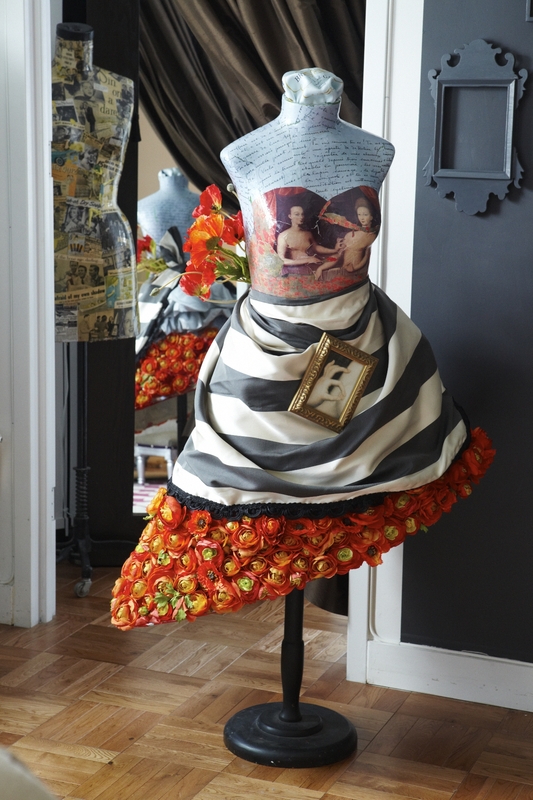 A few years ago, I found this used mannequin at a retail display supply outlet, and I embellished it with a papier-mâché skirt made with wire, covered with silk poppy flowers. Papier-mâché is one of my favorite mediums to work with, and this project inspired a DIY Rococo styled picture frame for the living room as well. From the skirt on up, the overall theme is Matisse’s poppy fields. The bodice is decoupaged with laser-printed images from a local printing shop. Unfortunately, ink-jet images from a home computer will bleed when it touches the decoupage glue and won’t work for this project. My dutiful friend, nicknamed “Moulin Rouge,” performs double-duty in this compact living room. It displays as a sculptural art piece and is a catchall for hats and other accessories. The mannequin keeps clutter at bay while taking up very little floor space. Through the years I have found old and damaged mannequins or dress forms at store display closeouts, fashion design schools and on Ebay. Check out davessurplus.com and your local Craigslist for some real bargains. A faux birthday cake made from two Styrofoam rounds tops the mannequin that lives in my kitchen. Use a polymer air-dry clay by Paperclip to create these pretty madeleine lookalikes. Just press the clay into a madeleine cookie mold, let dry and paint to look like threat thing. Since I have an open kitchen layout in my New York City apartment, the mannequin anchors the dining nook and separates it from the living room. Establish different zones in a small space to give the eye a variety of places to roam, which eases the feeling of a confined home. Customize your mannequins by stripping off all of the outside muslin fabric and padding and work with the raw frame. Most frames are made out of plastic and are easy to paint, decoupage and glue adornments on. Because mannequins are tall and lean, they shimmy into tight corners and cast the illusion of height in any tiny niche.